UPDATE FEBRUARY 16: Chicago police have now issued an alert that publicly connects two of the cases listed in our original report below. Wrigleyville's Subway restaurant was robbed Saturday afternoon by a man armed with a knife, just days after a different Subway shop was robbed here by a man armed with scissors. 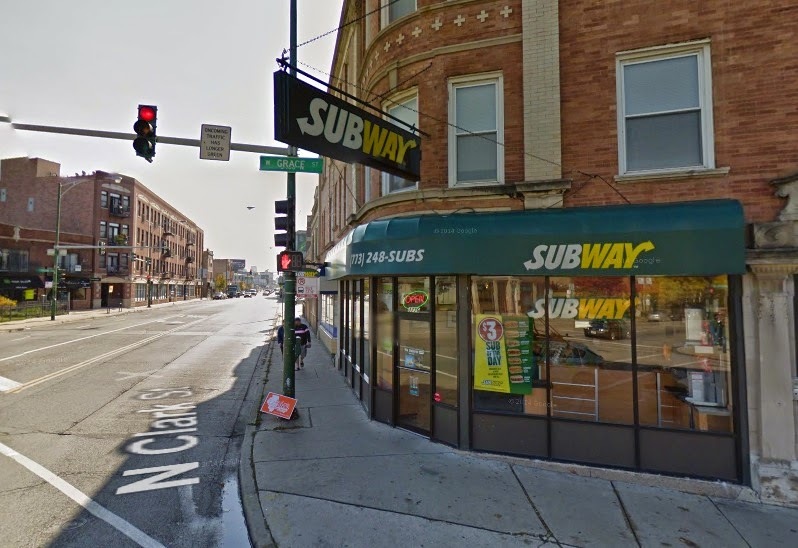 Detectives are working to determine if there is a connection between the two Subway cases as well as to a couple of other business robberies this week in nearby Uptown and North Center. All of the victims provided similar offender descriptions. Offender description: Male, white, about 25, tall, wearing a dark "nylon type" jacket with a dark hoodie underneath. He also wore jeans with a white fade on the front and black gym shoes. UPDATE 1:43AM FEBRUARY 16: In a newly-released alert, detectives now say the offender wore a "green or olive drab" jacket over a blue sweatshirt and "blue jeans with bleached or stonewashed sections on the front and back thighs." Offender description: Male, white, 25- to 30-years-old. He is said to have worn a black hooded jacket and an orange skull cap. Offender description: Male, white, 25- to 30-years-old, 5'9" tall, 150 pounds, brown hair. He was said to have worn a brown jacket, blue jeans, and a black scarf around his face. Defying black ice-covered sidewalks, a man robbed the Subway restaurant at 1020 Belmont last Sunday night while brandishing a pair of scissors. That offender was described as white, 25- to 30-years-old, wearing a black North Face brand jacket with its hood pulled up.